Every day small groups of tourists arrive in North Korea to see one of the most secretive countries in the world, and one which is prepared to show off a fairy tale representation of daily life, often hiding the reality. All tour programs are very well planned. DPRK welcomes guests with an army of guides, government minders, souvenir shop tenders, waiters, drivers. Every one of them is trained about do's and dont's when dealing with tourists. Guests observe the country through an invisible window. They can see and touch something, but when they reach further, they cannot get it. Portraits of the great leaders of North Korea Kim Il Sung (left) and Kim Jong Il (right) are displayed at Arirang festival in Pyongyang, North Korea. A gigantic card stunt is created by around 30,000 volunteers who simiultaneously flip coloured card. 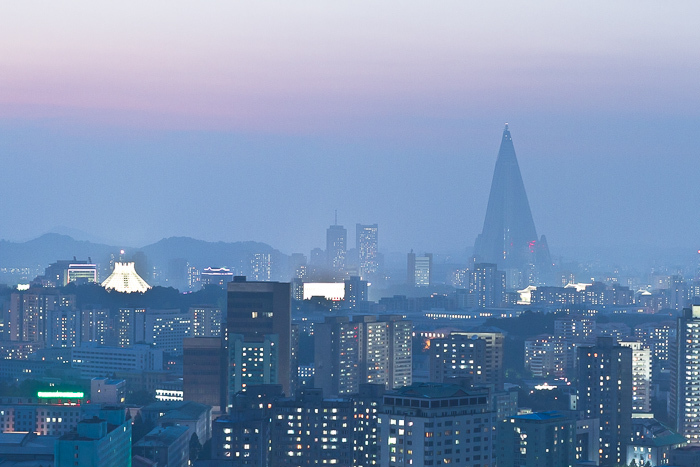 Skyline of Pyongyang at sunset with Ryugyong hotel in the distance. Construction of the Ryugyong hotel began in 1987 and was halted in 1992. It is now one of the most well known landmarks of North Korea. 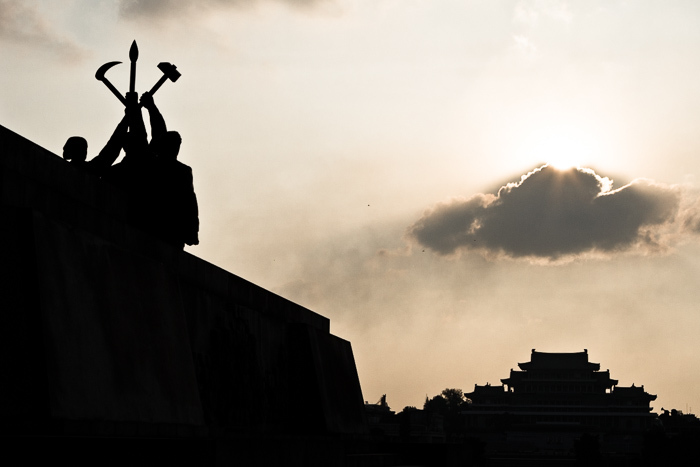 A group of women sweeping square on the Mansu hill in Pyongyang, North Korea. 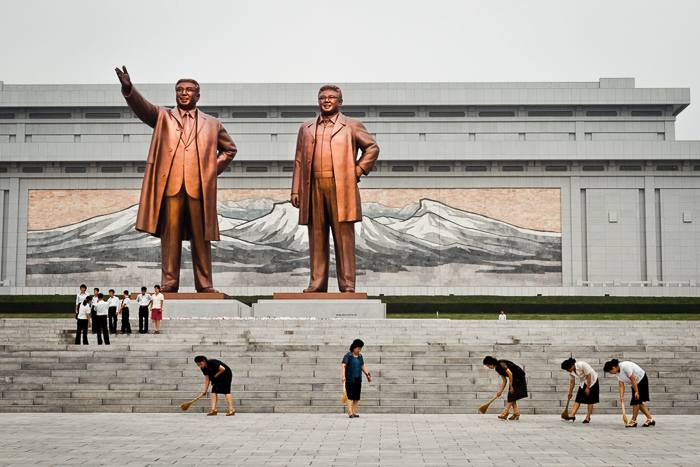 Sweeping the square is a common activity to pay tribute to the Great Leaders. 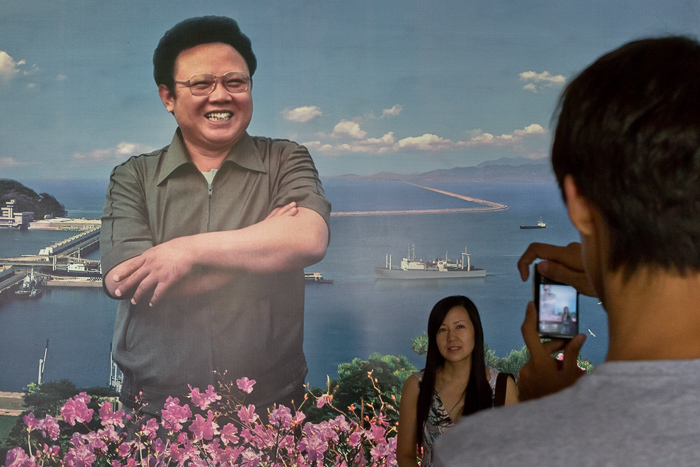 Chinese tourists take photos in front of a wall photo with Kim Jong Il at Nampho Dam in western North Korea. 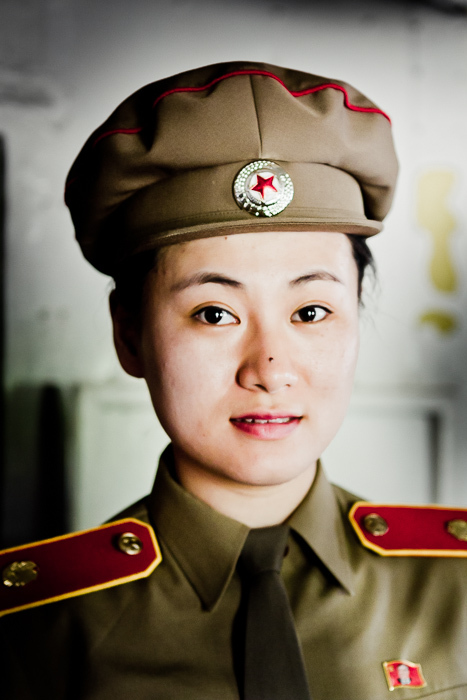 A lady attendant in a military uniform wearing a badge with Kim Il Sung at the US spy vessel "Pueblo" moored on Taedong river in Pyongyang, North Korea. Badges with Kim Il Sung and sometimes Kim Jong Il must be worn by all citizens of North Korea. 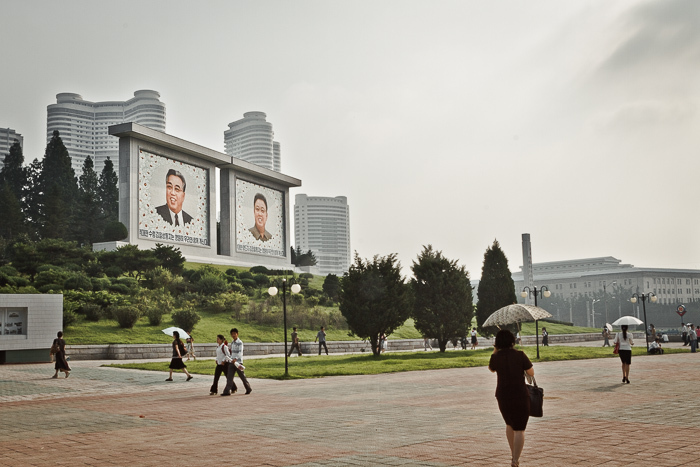 Portraits of the Great Leaders Kim Il Sung and Kim Jong Il in front of new Mansudae housing complex which opened in 2012 in Pyongyang, North Korea. 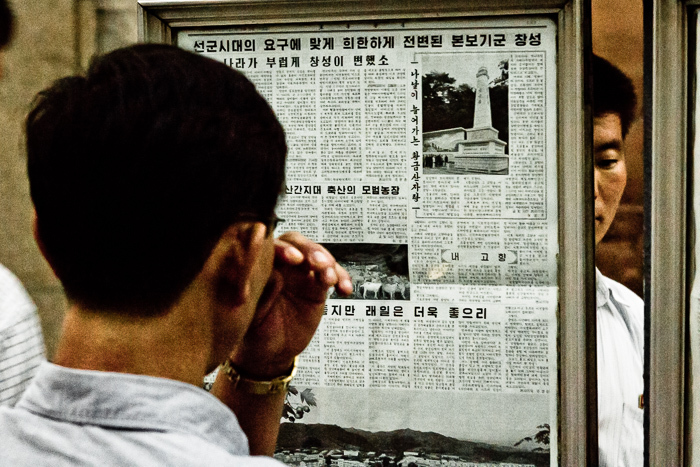 Two men reading newspaper at the Puhŭng (Revitalization) metro station in Pyongyang, North Korea. 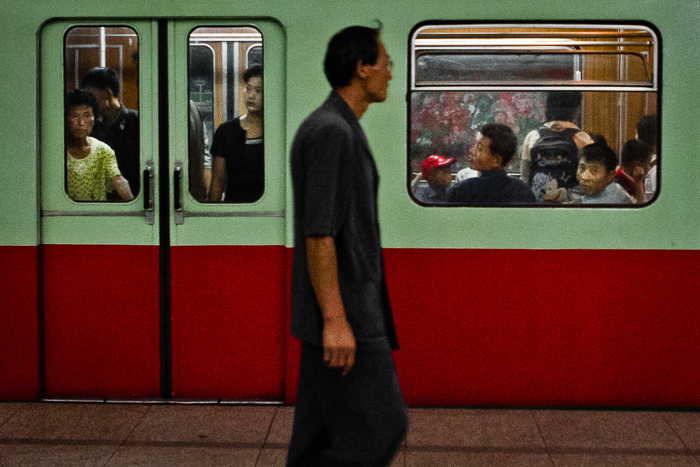 Man on the platform at Yŏnggwang (Glory) station in Pyongyang metro. 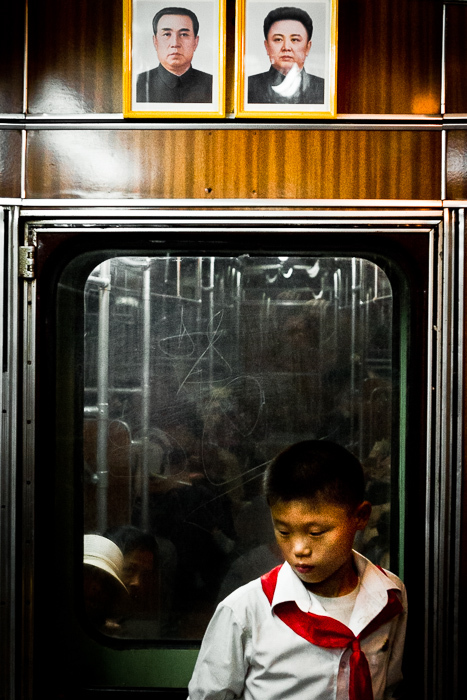 A school boy riding a train in the metro in Pyongyang, North Korea. 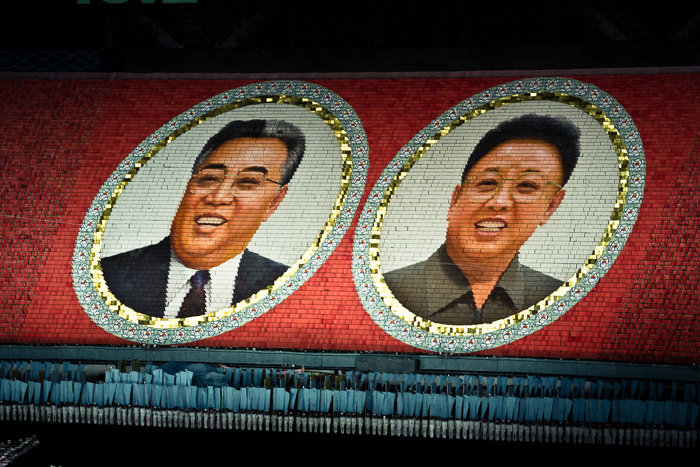 Portraits of Kim Il Sung and Kim Jong Il can be found in many public places and private houses across North Korea. 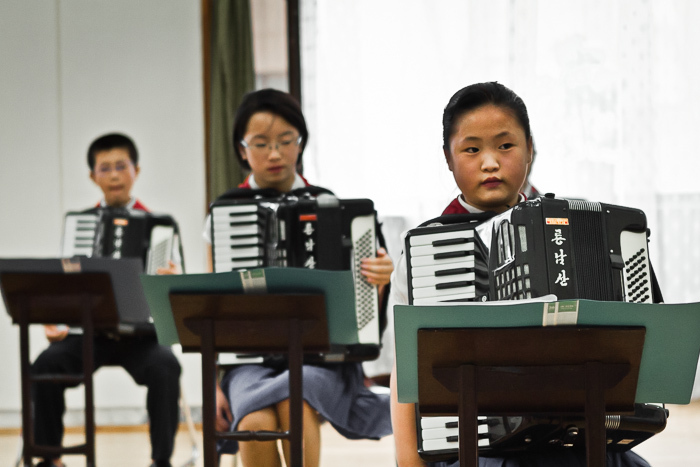 Kids playing accordions for visitors at the Mangyongdae Children's palace in Pyongyang, North Korea. 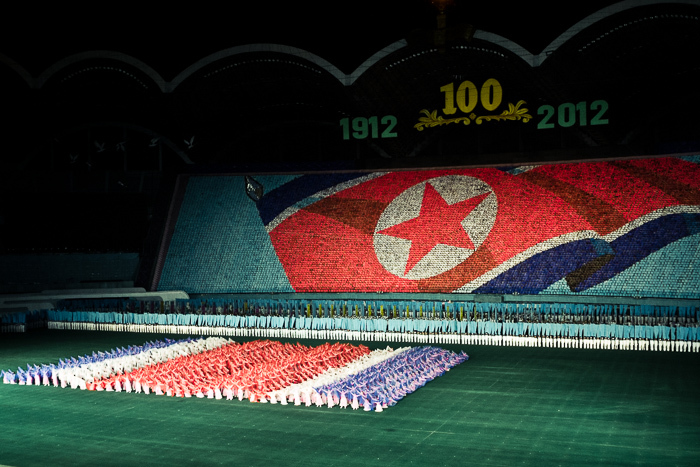 A man is taking his place in the middle of mosaic before the beginning of the Arirang festival in Pyongyang, North Korea. A huge moveable mosaic is created by around 30,000 volunteers. 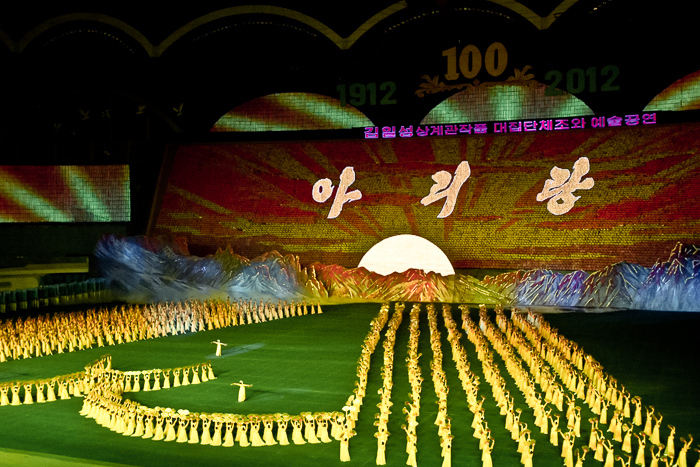 Gymnasts form rays of rising sun at Arirang festival in Pyongyang, North Korea. Gymnasts form a reflection of the national flag created by volunteers at Arirang festival in Pyongyang, North Korea. 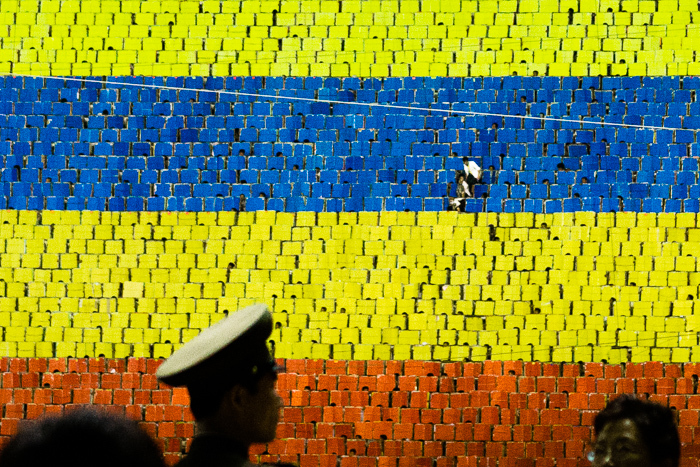 A gigantic card stunt is created by around 30,000 volunteers. 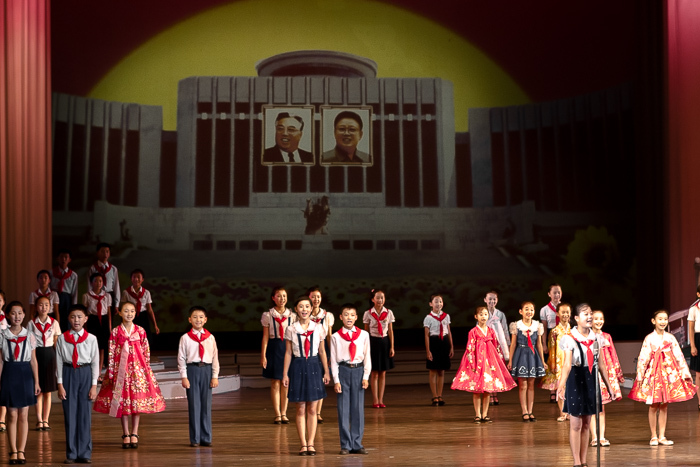 Children's talents performance at Mangyongdae Children's palce in Pyongyang. 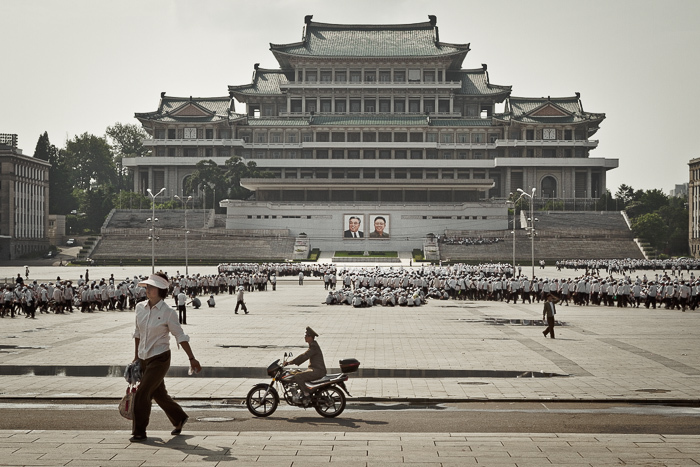 School kids rehearsing an anniversary demonstration at Kim Il Sung square in Pyongyang. 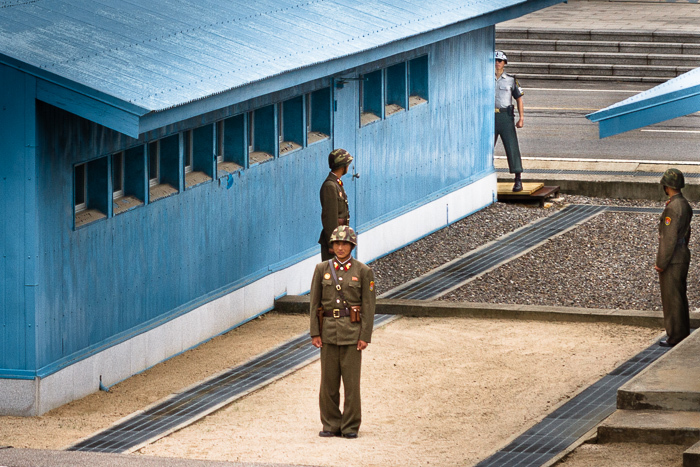 North (front) and South Korean (back) soldiers protecting the DMZ between two countries at Panmunjom. 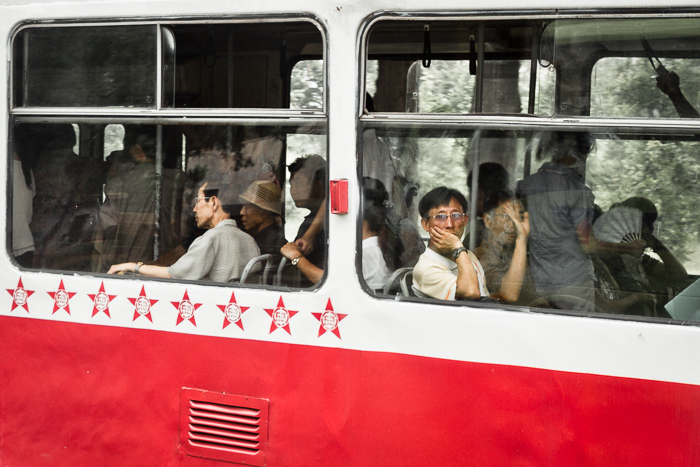 People on a tram in Pyongyang. Every star on the side of the tram commemorates 50,000 km of service. Stella in front of Juche monument in Pyongyang, North Korea. Sickle,brush and hammer represent farmers, intelligence and workers respectively. 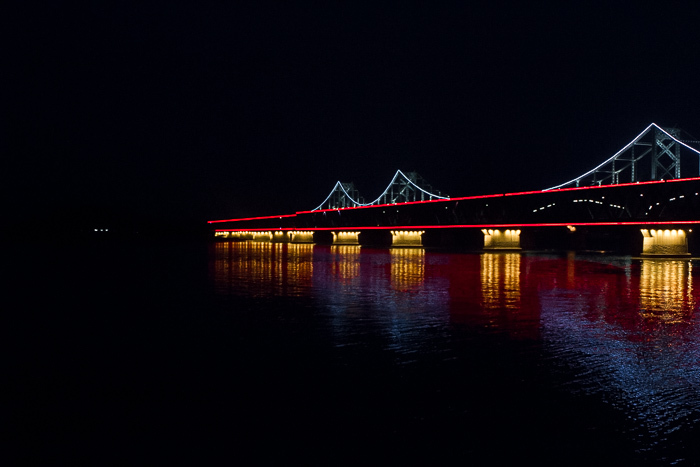 Lights on the Sino-Korean Friendship Bridge connecting North Korean city Sinuiju with Chinese Dandong end abruptly as it gets to North Korea. 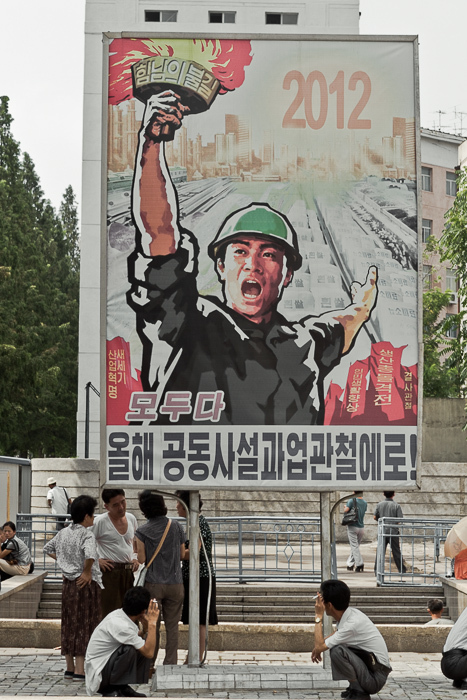 North Korea has problems with electricity supply.